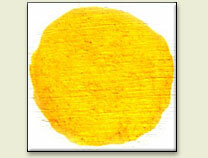 Cadmium sulfide can be made in various shades ranging from very light yellow to deep orange. It has very high hiding power and good permanence. Word origin: The name "Cadmium yellow" comes from Latin cadmia = zinc ore calamine, from Greek kadmeia = Cadmean earth, first found near Thebes, city founded by the Phoenician prince Cadmus..